ArtsArchitecture Director David Wright has over 25 years’ professional experience, gained almost exclusively in the arts sector. A Chartered Architect and member of the Royal Institute of British Architects, David has designed, built and refurbished many high-profile arts buildings in the UK and abroad. Formerly a Director of RHWL LLP, where he led the design teams for many of their cultural projects, he founded his own architecture and consultancy practice ArtsArchitecture in 2005. He is one of the UK’s most experienced architects in the field. His work includes museums, galleries, conference and exhibition facilities, theatres and concert halls. David applies the same rigour and attention to detail to projects whatever the size. 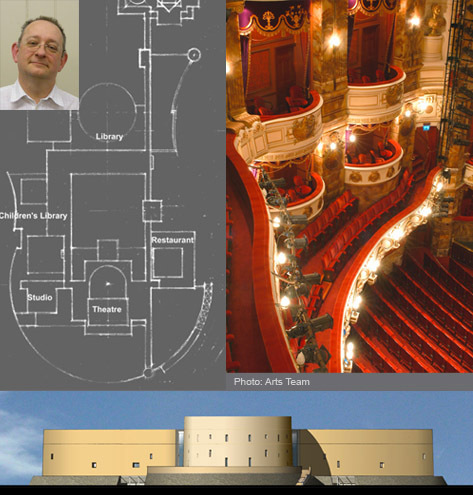 He has developed a specialism in conservation and refurbishment of listed buildings, including the Brighton Dome and Corn Exchange (listed Grade 1), London Coliseum and Lyceum Theatre Sheffield (listed Grade 2*). He also designs bespoke light fittings and furnishings.